To upgrade a vCenter Server Appliance (vCSA) you can either use the online repository or download an upgrade ISO. When the vCSA has internet access, the simplest way is to use the online repository. Otherwise, you have to manually download the ISO, upload it to a datastore and mount it to the vCSA. (Optional) Download Upgrade ISO from VMware Product Patches. 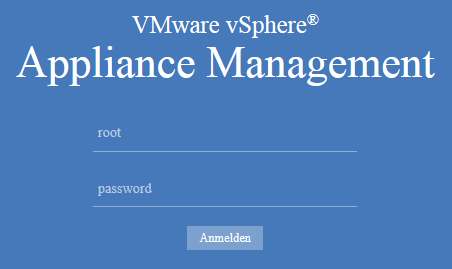 Open vCenters Appliance Management Page (https://[VCSA-Address]:5480) and login as root. 6.5.0.5500 Build Number 5318154As of writing this post, the update was not yet available in the repository. In that case, you have to download the Upgrade ISO as mentioned in Step 1. Press Install Updates to start the update process. Close the original browser window and launch a new browser to login back into the vSphere Web Client. You may also need to clear your browser’s cache. This step is very important to prevent issues with the Web Client after upgrading. That's it for the vCenter Server Appliance. The next task for the vSAN cluster upgrade is to upgrade ESXi hosts to version 6.5.0d (Build 5310538). There are two popular ways of upgrading ESXi: vSphere Update Manager, or via the ESXCLI. If you use Update Manager to upgrade the hosts, the default evacuation mode is "Ensure data accessibility". If you use this mode, and while upgrading Virtual SAN you encounter a failure, your data will be at risk. I'm using ESXCLI because I only have a few hosts to upgrade. Upload the .zip file to a datastore. Place the first ESXi host in maintenance mode.Select the Ensure data accessibility or Evacuate all data evacuation mode, depending on your requirement, and wait for the host to enter maintenance mode. Please note that evacuating all data takes a lot of time, but might prevent data loss in case of failures during the upgrade. Connect to the ESXi host with SSH. Run the following command to install the upgrade. 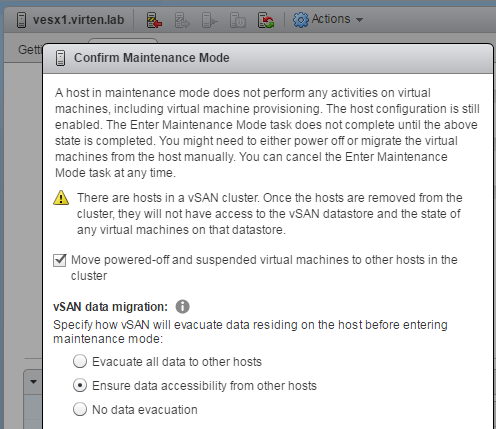 Once the upgrade is completed, repeat the steps for all hosts in the vSAN Cluster. At this point, the upgrade to vSAN 6.6 is finished, but the on-disk format is still on version 3.0. It is not required but recommended to upgrade the Virtual SAN disk format to the latest version. I'm using the Ruby vSphere Console (RVC) to continue with the disk format upgrade. If you are not familiar with RVC, refer to my Getting Started with Ruby vSphere Console (RVC) article or the RVC Guide. Log in to the vCenter Server using RVC. Mark the vSAN Cluster for further usage. This allows you to use ~vsan instead of the full path when running commands. Make sure that the Health Status for all disks is OK.
2017-04-18 21:48:55 +0000: Check cluster status for disk format conversion. 2017-04-18 21:48:55 +0000: Update vSAN system settings. 2017-04-18 21:48:59 +0000: Check cluster status for disk format conversion. 2017-04-18 21:48:59 +0000: Update vSAN system settings. 2017-04-18 21:48:59 +0000: Disk format conversion is done. 2017-04-18 21:49:02 +0000: Check existing objects on vSAN. 2017-04-18 21:49:02 +0000: Object conversion is done. Depending on your vSAN size, this task may take a lot of time. Use the vsan.obj_status_report command to verify that the object versions are upgraded to the new on-disk format. The Virtual SAN cluster upgrade is now completed. Verify the vSAN license as in some cases, you must reapply licenses. 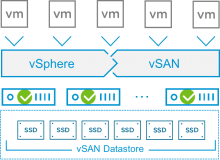 read your step 4 "Start the upgrade with vsan.ondisk_upgrade". Have you noticed that it took only 2 minutes and really no disk conversion was done since they were already compliant? Some ondisk updates do only change meta information, so no data needs to be moved. This usually takes a few minutes.